Kelly led the Wee County to successive promotions in the league. 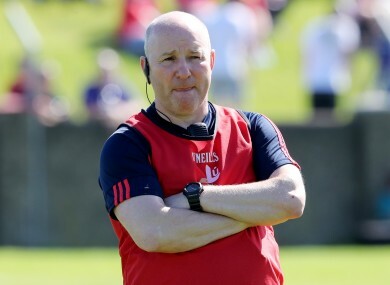 LOUTH HAVE CONFIRMED that Colin Kelly has stepped down from his position as senior football manager in the wake of their qualifer defeat to Longford. A former star player, Kelly led the Wee County to successive promotions in the league but they struggled to make an impact on the championship during this three years in charge. A heavy defeat to Meath in Leinster was followed by the loss to Longford two weeks later, and Kelly has confirmed he won’t be seeking another term in charge of his native county. “I believe the time is right for someone else to take a fresh approach with a talented and committed group of players,” he said in a statement today. “Our Championship ended on a disappointing note but the players have achieved progress with back to back promotions taking the county to Division 2. “I wish to thank all members of my management team and the players for their efforts. Email “Louth are searching for a new manager after Colin Kelly confirms his departure”. Feedback on “Louth are searching for a new manager after Colin Kelly confirms his departure”.